Watercolour of the Nawab Mubarak al-Daula of Murshidabad (1770-93) enthroned in durbar, by an anonymous artist working in the Murshidabad style, c. 1790-1800. 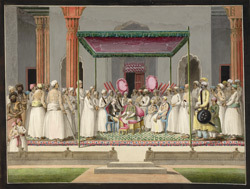 Inscribed on the back in ink and pencil: 'Nabob's Durbar and reception of the English Resident at Morshedabad'. Murshidabad is situated on the banks of the Bhagirathi River, north of Calcutta in West Bengal. In 1704, the Nawab of Bengal transferred his capital here from Dacca; in 1757 a series of military disputes between the Nawab and the English East India Company resulted in the rise of English supremacy in Bengal. Although the town of Murshidabad continued to house the residence of the Nawab, it was no longer a place of political power. This drawing depicts the Nawab at durbar with the British Resident, Sir John Hadley D'Oyly. The Nawab's son, Babar 'Ali and a minister are also seated near the Nawab on European chairs. Sir John Hadley D'Oyly was the East India Copany's Resident at the Murshidabad court from 1780 to 1785.